The National Park Service has closed the Summit District of Haleakalā National Park to all visitation due to snowy and icy road conditions and power outages throughout the District. This closure will remain in effect at least through 9 a.m. on Monday Feb. 11, 2019 with no sunrise visitation allowed to protect visitor and employee safety. The Summit District will be reopened when condition improve. 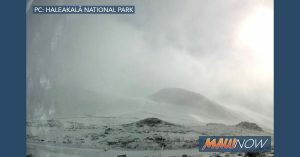 Up to three inches of snow is forecast at the summit of Haleakalā on Maui as a powerful winter storm tracks southward toward the island chain today, according to the National Weather Service. The agency issued a winter weather advisory for the summit of Haleakalā until 6 p.m. saying the storm will bring a band of enhanced moisture that is likely to produce accumulating snow over the summit above the 8,000 foot elevation. “In addition to the snow, very windy conditions and unusually cold temperatures are expected,” the NWS said. The NWS forecast calls for the start of snow this morning, with continuing accumulation through this afternoon. “The snow will be locally heavy as intense snow showers move through. Plan on slippery road conditions along with blowing and drifting snow. Total snow accumulations of up to 3 inches are expected,” the NWS advisory said. Periods of snow will make travel difficult with visibility to be reduced to a quarter mile at times. The NWS advises those in the area to be prepared for snow covered roads and use extreme caution while driving. In late January, the National Park Service reported snow flurries at the summit , with no accumulation. Prior to that, the last time it snowed at Haleakalā  was February 19th of last year, when 1.5 inches of snow and a heavy layer of ice was reported.